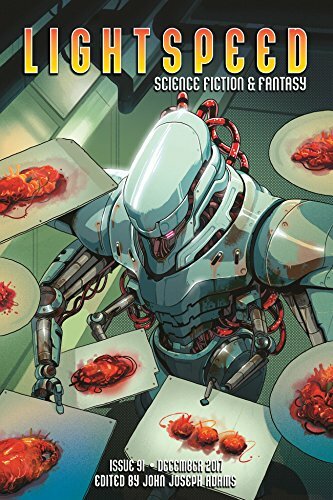 More specifically, it’s about a bunch of cyborgs who are fleeing human beings; only their stolen spaceship is a food service vehicle, so they keep getting pinged by human ships wanting to place takeout orders. In the meantime, they must wrestle with problems of low morale and scanty resources. The personality conflicts so common among kitchen staff inevitably arise. Despite my deadpan synopsis, this is a laugh-out-loud funny story made even better by narrator Claire Benedek’s masterful voice acting. She creates a convincing contrast between Friendly — the most human of the cyborgs — and Engineer, who becomes most obsessed with cooking. Like the chefs closed their eyes and dumped handfuls of ingredients onto the grill. But they didn’t charge me anything, so I’m giving it two stars instead of one. This impressive audio offering is brought to you by Lightspeed Magazine, edited by John Joseph Adams. Click on their link to find out more about them, including their podcasts produced by Skyboat Media. Audio intro and outro by Jim Freund of Hour of the Wolf fame. Illustration by Christopher Park. “The Greatest One-Star Restaurant in the Whole Quadrant” is from Lightspeed #91, where you can also read the story in text format.